I’ve been away for a while, so I thought it was time for an update. 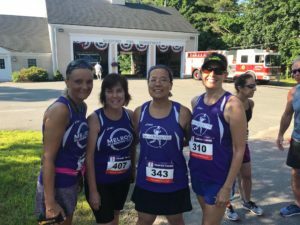 We had 29 runners at the Melrose Firefighter’s 5K on June 17th and 4 MRC runners at the Lahey Health 5K on June 23rd. I may drop the Lahey race from next year’s schedule as it doesn’t seem to be very popular with the club. They had 1075 runners but we only had four run. The Melrose Fire Fighter’s had 341 runners and Melrose Running Club had 29 runners and the 2nd largest team! Our team also came in 2nd in the over-all team time results, just 1:09 minutes behind Team Kay Family. Charlotte Tysall was the 2nd place female over all with a time of 20:45! Mike Sikkema was the 5th male over all and 1st in his age group. Lisa Tysall won her age group! Diarmuid Cahill came in 2nd in his age group and many other runners finished in the top 10 for their age group. I didn’t see any age group wins or over-all wins for these races. Durm, Charlotte and Andy have run 4 races. Thuy, Steph and Mary still have a shot at the jacket. The rest of us are running just for the fun of it, as always! 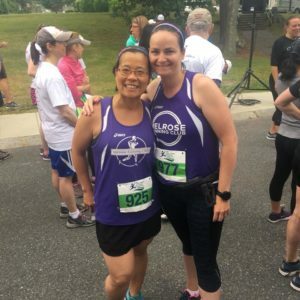 Join team Melrose Running Club. Entry is $35 and there are NO FEES! Fundraising is suggested but not required. Just enter $100 into the amount field. The Race Director told me that they will not bill you for the difference, but would be thrilled if you raised a bunch of money. Maybe the club can do a raffle basket or a 50/50 drawing? Anyone have ideas? September 22nd is the BCBS Island Run 5K and 5 Miler. The boat leaves at 9:00AM and proper ID is required. $50 includes your race, lunch, 21+ beverages and round-trip ride to Spectacle Island. A deal that can’t be beat! Hallmark Health still has nothing on their we site. The Howling Wolf Half moved to October 28th so we will have two races in October and don’t need a 3rd. May have to drop Hallmark if I don’t hear from them. We do need a November race though. Give me some ideas! And we wind up the year with the Bill Rodgers Jingle Bell Run in Somerville. No date yet but I’ll keep you posted. This entry was posted on Wednesday, July 18th, 2018 at 12:35 pm	and is filed under Club Races. You can follow any responses to this entry through the RSS 2.0 feed. You can leave a response, or trackback from your own site.